Cycling around Eindhoven's Strijp-s area we stumbled upon another former Phillips factory building that has been recycled into a stunning design space. 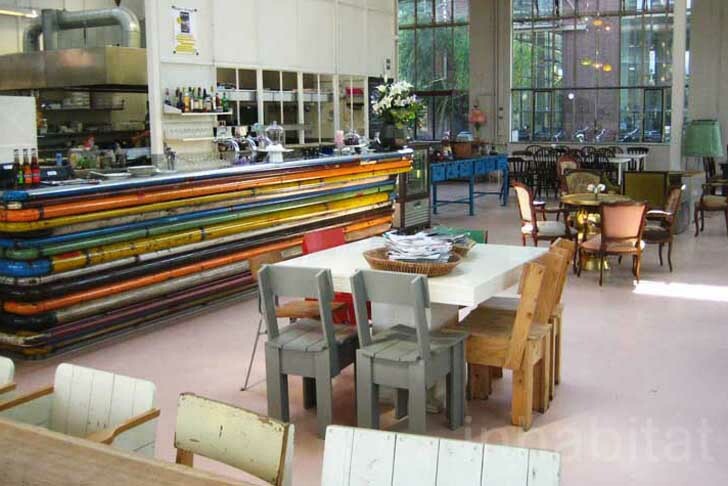 The Restaurant of Piet Hein Eek and his partner in crime Nob Ruijgrok is a wonderful place to have lunch or dinner, and the space is filled upcycled furniture. The restaurant first opened its doors back in 2010 during the start of that year's Dutch Design Week, and the green interior reflects the company's ethos of combining fun with sophistication. The Restaurant of Piet Hein Eek is filled with the designer’s own pieces, including his signature recycled wood furniture finished with a high gloss varnish. All pieces are unique and made from waste diverted into interior design, like the colourful bar made from old steel pipes. The “Old lampshade-lamp” is a collection of mix-match lights that as a collection create an astonishing chandelier feature. Eek’s piled up recycled wooden stools below some yummy Garden Nasturtium, together with a found church chandelier, are some of the pieces that fill this brilliant space. The walls and floors were rescued from another of Philips‘ enormous warehouse buildings and now serve as a venue for local cultural events. A long table topped by “Hanging Wire Lamp in Tie Silk” is reserved for large groups. The Restaurant of Piet Hein Eek is filled with the designer's own pieces including his signature patchwork wooden style furniture finished with a high gloss varnish. 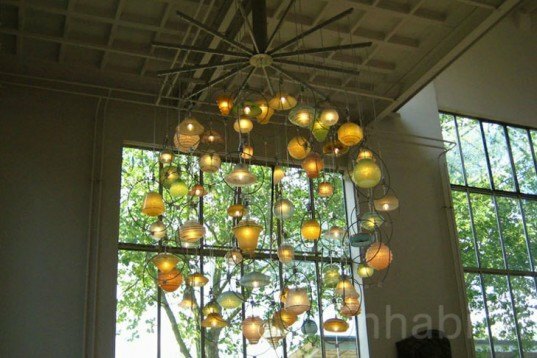 All pieces are unique and made from "waste diverted into interior design" like the colourful bar made from old steel pipes. The "Old lampshade-lamp" is a collection of mix-match lights that as a collection create an astonishing chandelier feature. Eek's piled up recycled wooden stools below some yummy Garden Nasturtium, together with a found church chandelier are some of the pieces that help making this brilliant space. The walls and floors were rescued from another of Phillips' enormous warehouse buildings and now serve as a display for local cultural events. A long table topped by "Hanging Wire Lamp in Tie Silk" is usually used for large groups and the restaurant's stuff. Serving European, Asian and African, The Restaurant of Piet Hein Eek is the perfect place for some good quality yummy food within the visionary Dutch city of Design and Technology.